Google has been making every effort to reduce the gender bias in machine learning this year. The most recent step is tackling the gender dimension by providing gender-specific translations for some languages ​​in Google Translate, one of the most widely used online translation services. Another step Google recently taken to promote fairness in artificial intelligence and machine learning was the removal of gender-specific pronouns from Gmail's Smart Compose feature. The company decided to remove them completely after it was convinced that there was no other way to ensure that Smart Compose is completely gender specific. Google Translate has provided only one translation for each query in the past, even if the translation is in a male or female form. By producing only one translation, the model unintentionally replicated existing gender stereotypes. "It would be masculine for words like" strong "or" doctor "and female for other words like" nurse "or" beautiful, "adds Google. 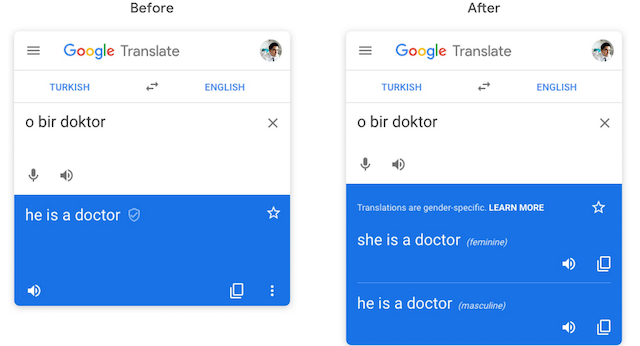 The company says that users are now both female and male translate a single word from English to Italian, French, Spanish, and Portuguese, and only the Turkish-English pair provides translations for phrases, which is currently only available in browsers, but can also work in apps, Google says Future will add more languages.